For example, if you're a Windows 7 user, you may be wondering why Explorer lacks the pull-down menus (File, Edit, View, etc.) found in previous versions (and, indeed, in most other programs). Answer: sometimes Microsoft makes changes merely for the sake of making changes. Fortunately, not all of those changes are irreversible. 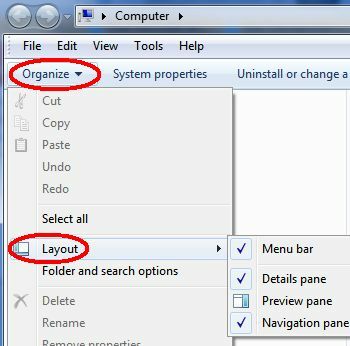 Let's take a look at some ways to change the layout of Windows Explorer--including restoring those pull-down menus. The first of these is Menu Bar, which, by default, is disabled. Click it and those familiar pull-down menus magically reappear. Details pane: The Details pane appears at the bottom of the Explorer window. True to its name, it provides details on whatever item(s) you've selected--drives, files, folders, etc. However, you get very little info on drives and folders, and a bunch of mostly unnecessary info on files, so consider unchecking Details pane to free up some extra viewing area in Explorer. Preview pane: One of Explorer's hidden gems, the Preview pane (which appears to the right) shows a preview of whatever file you click: Word document, Excel spreadsheet, PDF, photo, etc. That's a great way to make sure you've found the file you want before you actually open it. Even better, click a music file or video and you can play it right in the Preview pane (as long as it's compatible with Windows Media Player). I consider this an essential part of Windows Explorer, so by all means enable it. Navigation pane: The Navigation pane is the one on the left side of Explorer. Without it, you wouldn't be able to access Favorites, Libraries, Homegroup, and everything else. Unless you have some specific reason for disabling it, I'd leave it alone. I'll talk more about Explorer in the days to come. In the meantime, if you have a specific question about the tool, send it my way: hasslefree@pcworld.com.